First stop, Blueberry Hill RV Resort – Bushnell, FL – RV Cheaper! 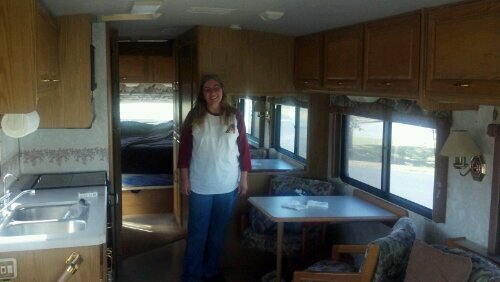 We had flown Arizona to Florida to pick up our RV, we had none of our RV supplies but did make room in our luggage for a clean set of sheets. Blueberry Hill was across a small side street from a Super Walmart and several fast food restaurants. The RV resort office was just getting ready to close as we drove up and they waited for us to explain the amenities before leaving. We made two trips to the store for food, some basic stuff for the trip and had ourselves ready to hit the road. The only negative on this stop was we could not get the gas furnace or water heater to run, which meant the fridge would only work while we have 110 volt hookup. Luckily with hookups we were able to get the fridge cold by morning. The couple in the next RV site were walking their dog and we talked with them for over a half hour learning a lot from them since they are on their 8th RV and they have traveled all over the US and Canada during the last 28 years! At one point we mentioned about the propane appliances not working even though we had 1/4 tank left. Robert informed us that the propane leak detector must be turned on to allow gas to flow. We went in and looked and shazzam!! we have heat, hot water and the fridge will stay cold while we are on the road!